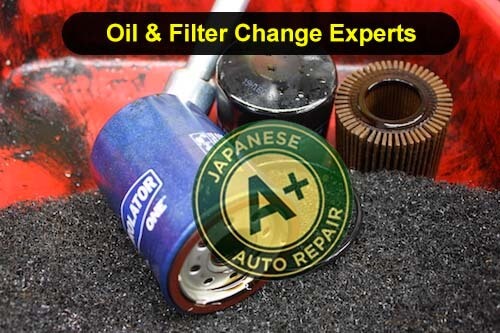 San Carlos Oil Change Service - A+ Japanese Auto Repair, Inc.
Family Owned & Operated Fully Auto Repair & Service Facility. Most vehicle manufacturers recommend an engine oil change every 3,500 to 5,000 miles or every 4-6 months. It is important for all drivers to note, because the scheduled service for oil changes might look a little different in your owner’s manual. For example, many owners’ manuals recommend changing the oil once a year or every 7,500 miles – sometimes higher! Why this contradiction you ask? Learn more about how often you should change your engine oil. Fig A. How do I check my engine oil level? Remove the engine oil dipstick again and check where the lowest sign of engine oil is on the dipstick. That is the current engine oil level. See Fig A. There should be two indicators on the engine oil dipstick at the bottom. The top indicator is the full mark, the bottom indicator is the low mark. Typically the range of engine oil between the two marks on the dipstick is one quart of engine oil. Again, see Fig A. for a representation on this. 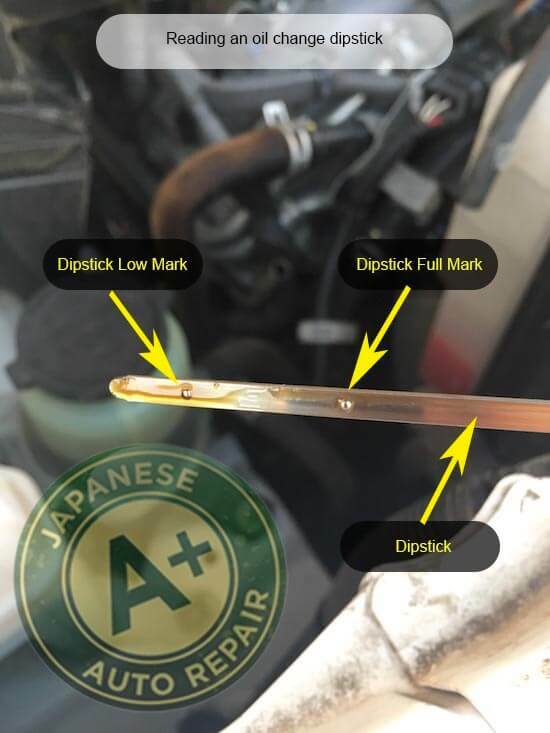 If there is any question on the steps above feel free to stop by A+ Japanese Auto Repair Inc. and we can show you how to check fluid levels and conditions in person. If you are outside our service range and have questions please contact your local service center or consult your owners manual. Note: Clean engine oil should be a transparent yellow color when it comes new. Dirty engine oil will be closer to a dark coffee color with a thicker consistency. To avoid costly engine repairs stick with manufacturers recommend service intervals listed in your vehicles owners manual. Do I need to change my engine oil when the maintenance required light comes on? This maintenance required like comes on at different engine oil & filter intervals for different model vehicles. On average, Japanese made vehicles like Toyota & Honda, will require their engine oil and filter change at 5,000 miles. For Toyota & Lexus, the maintenance required light will flash at 4,500 miles and then stay on solid at 5,000 from the last time the maintenance required light was reset. For Honda & Acura, the maintenance required light is typically a message on the dash stating A1 or B1 service due, which is an engine oil and filter change plus some extra service & inspection. Nissan & Infiniti engine oil and filter change reminders are also in a message form for the driver's convenience based on the last time the engine oil and filter change was completed. One thing to remember is that mechanics don't always reset your maintenance required light. Be sure to check when your last engine oil and filter change or you can stop by A+ Japanese Auto Repair in San Carlos and we will do an engine oil check for you at no charge. Fig B. What type of engine oil weight do i put in my vehicle? 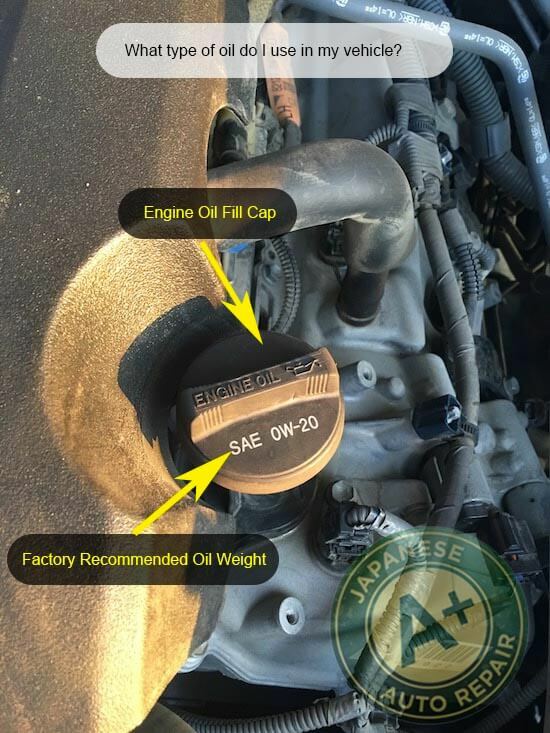 As a general guide, Toyota, Lexus, Honda, Acura, Infiniti, Nissan, Subaru, Mazda, and other Japanese models use 0-20w, 5-20w, and 10-30w engine oil. As vehicles get older and start to burn engine oil, we advise our customers to use a slightly thicker oil during the engine oil and filter change, which will help slow the oil consumption issues. To learn more about what the maintenance required light means when it comes on the dash. What happens if my car is burning oil? If your car is burning engine oil, this usually means you have a worn internal engine component or worn out valve seals. The engine oil is made to go through and around the moving engine parts but over time, these moving parts get worn. When the moving parts get worn, the space where the engine oil moves gets bigger and allows engine oil to bypass it's seal and burn up on the engine. Fortunately, if your car is burning engine oil, you can slow the burning by adding thicker engine oil or by adding certain oil additives. If you would like immediate help with your engine oil and filter change, please feel free to call us at 650-946-1856, text us at 650-750-8233, or make an appointment.